Hello again, friends! If you’ve been following along, you know I’ve been reading The Differentiated Classroom by Carol Ann Tomlinson. I just finished chapter four, titled Learning Environments That Support Differentiated Instruction and found it rather inspiring. 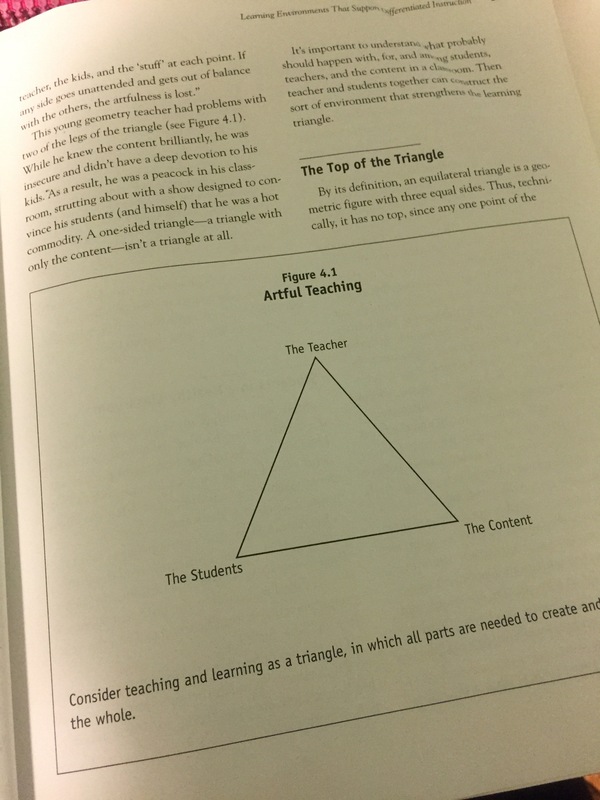 The chapter discusses teaching as a learning triangle in which the teacher, students, and content are all represented by a side; they all need one another in order to work properly. I found the chapter particularly inspiring for those times when you just feel overwhelmed. It discusses what children need in their learning environment and how teachers can support them. 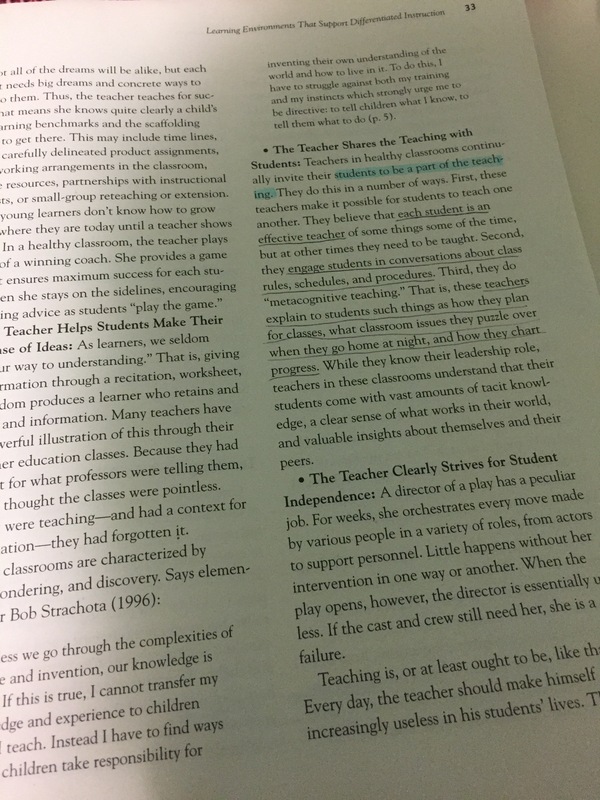 Additionally, the chapter details precisely the teacher’s role in a Differentiated Classroom and how to achieve it. I found this particularly helpful as a reminder of how to set up a classroom as well as to calm the nerves of teachers like myself who become stressed when we can’t be everywhere at once. After all, one of the most important skills we teach students is independence. I found this chapter very enjoyable and helpful (much more so than chapter three). It’s nice to read about and remember what a happy, constructive classroom and remind ourselves that that does not look like quiet kids sitting in strict rows. 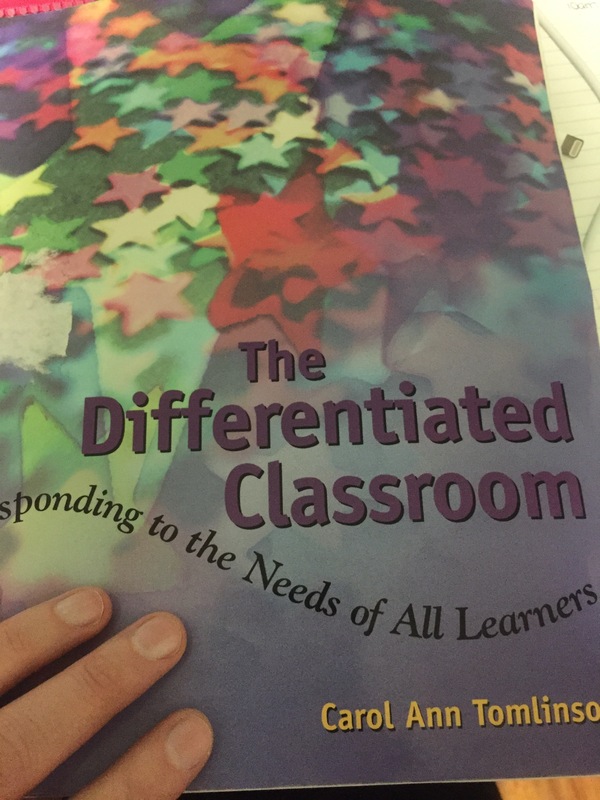 If you’d like to purchase The Differentiated Classroom, click here to find it on Amazon. Thanks for reading, stay posted for chapter five!